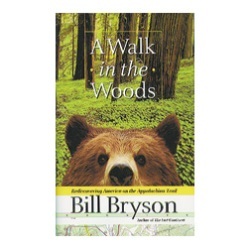 A Walk in the Woods,by Bill Bryson, 1998. Of the dozens of AT narratives written through the years, this is the one that hit the best-seller lists. The bumblings of Bryson and Katz, his portly hiking pal, are hilarious. The book has a serious, thoughtful side, too. A great read. 276 pp, 6” x 9 ½”.